We are an international Group with a long territorial tradition and in continuous growth, with a Customer focused sales and assistance network. We are a Family that proudly and enthusiastically develops the technical and social skills of its people. We develop safe, reliable, high quality solutions for the global railway and advanced industry markets. We work with the most advanced and efficient technologies, leveraging digital transformation and lean management. We ensure flexibility, customization and sustainability thanks to the steel production integrated into the safest and most innovative industrial processes. manufacturing of high-end railway components – wheels, axles and wheelsets for high-speed applications, locomotives, passenger trains, trams and underground trains. manufacturing of forging and casting to drawings, for various applications such as power generation, oil and gas, offshore platforms, cement works, industrial plants, iron and steel production plants or shipbuilding. Lucchini RS also produces a large variety of tool steel grades for plastic moulding, pressure die-casting and extrusion. 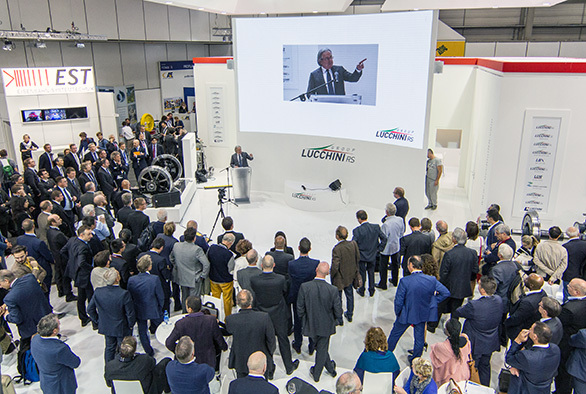 Giuseppe Lucchini, President of Lucchini RS Group, giving a speech at Innotrans 2016. G. Andrea Gregorini moved his company, together with the manpower, from Vezza d’Oglio to Lovere and established a company for steel, casting and forging production. The original workshop in Lovere becomes a fully-fledged iron and steel mill, and the business develops rapidly thanks to the abundant supply of water resources. Charcoal- fired blast furnaces are built to produce cast iron. A Pernot furnace is also started up. Lovere Plant sets up the production of Railway wheels and axles on a large scale. Lovere Plant is taken over by the state-owned ILVA. The production of wheels and rims for the Italian State Railways continuously requires heavy investments in machines and tools. The foundry shop, the forging shop and the mechanical workshops are also equipped with new machinery. A foundry, a forging shop and a mechanical workshop are started up. Small mechanical workshop was set up to produce weapons, bullets and farming tools for military industry. The state-owned company Italsider takes over Lovere, which, together with Triest, Savona, San Giovanni Valdarno and Novi Ligure, form the so-called “second machining” division. Lovere Plant is acquired by Terni Group. The Plant becomes a Company named Lovere Sidermeccanica. In the frame of the divestitures planned by the restructuration plan of the state-owned steel industry, Lovere Sidermeccanica is privatised and acquired by Lucchini Group. Lucchini UK and Lucchini Sweden are taken-over from AD-Tranz and Lucchini Poland is established. The 70% of Lucchini Group is acquired by the Russian Severstal Group. The 100% of the Company is acquired by Sinpar Spa, the holding of Lucchini Family. The Chinese Joint Venture with Zhibo Transport in Taiyuan is established. A new business name and logo are created. Lucchini Beijing in China is established and a commercial division is created in India: Lucchini IN. Major investment of 180 mt to modernise the whole plant of Lovere is signed off. New rolling mill for train wheels started up. New automatic axle machining line and wheels machining center. New automatic axle forging line. New heat treatment facility for heavy forged / cast components (150t). LBX in Belgium is founded. Lucchini Mamé Forge and Lucchini Central Europe are established. Integration of wheel forging and heat treatment lines. Lucchini South Africa is established in Johannesburg. Lucchini Tool Steel and Lucchini NA are established, in Italy and North America, respectively. Lucchini Industries is established in Italy.